The beauty ideal: My new Favourite Base Duo. My new Favourite Base Duo. 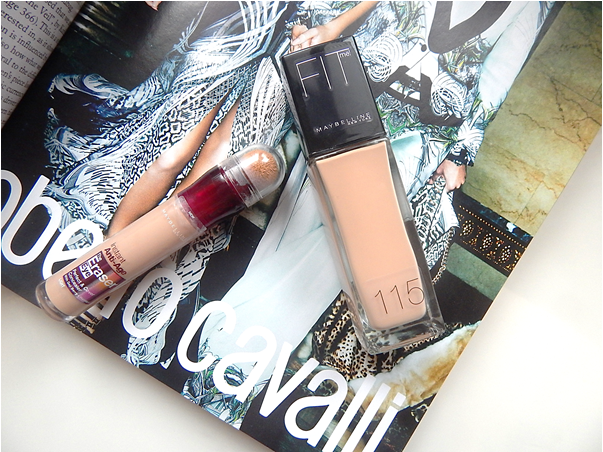 Maybelline have just been the brand of the moment for me recently. I recently picked up The Eraser and I've been loving it to conceal my under eye circles and for general highlighting around my face. For me, it covers and blends well and when set, lasts all day. I also recently re-purchased their Fit Me foundation. Now, I used to use this a couple of years back and for reasons I can't recall I stopped using it. I wanted to add it back into my collection because KathleenLights raves about it on her channel - but she likes it for it's dewy finish. I find that it isn't so dewy on me, but actually remains quite matte and keeps my oils at bay really well for a drugstore foundation. The only issue I have with this - and pretty much any drugstore foundation - is it's shade. It's a tad too dark for me but I can make it work if I blend it down my neck (which is a total pain in my derrière, I'll be honest). I hope the official matte version of this foundation hits the UK soon, I'm intrigued as to whether or not I'll like that one better. I really wasn't a fan of this foundation, it was a nightmare to blend. Would love to try The Eraser though.